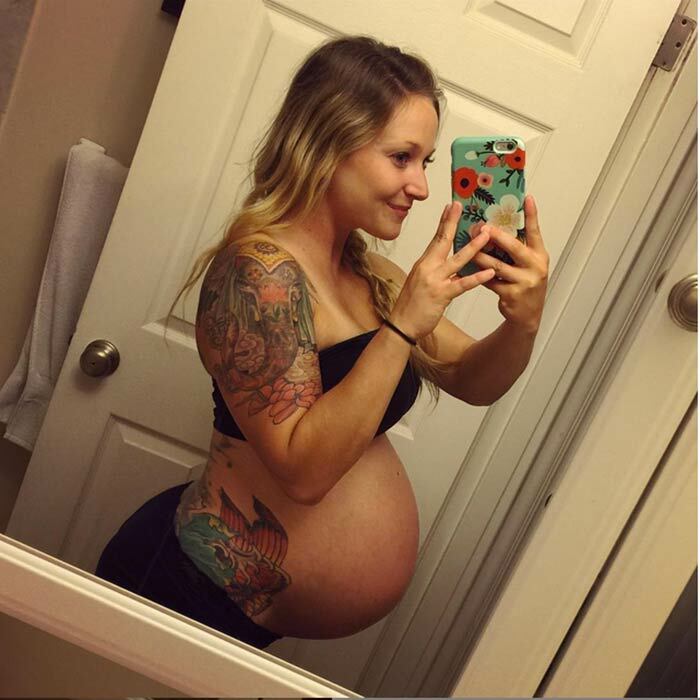 Amy Updike—@fitamysuzanne—has been weightlifting through pregnancy and sharing it with her 139K Instagram followers. Here's her advice for staying fit all 9 months. 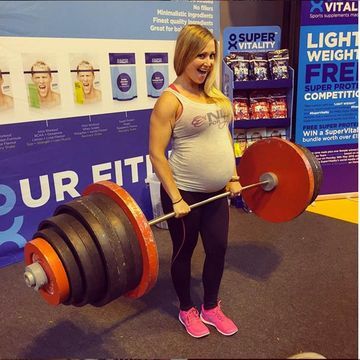 Salt Lake City-based mom of one (with another due any moment), Amy Updike is not only a pediatric registered nurse, she's also an International Federation of Bodybuilding and Fitness (IFBB) Bikini Professional who is still lifting weights like a pro—even when nearly nine months pregnant. It's no wonder the 29-year-old has garnered an Instagram following of 139,000. We sat down with Updike to chat about her amazing preg bod, fitness tips and how she keeps the naysayers at bay. Fit Pregnancy: Have you always been involved in fitness? Amy Updike: For the past two-and-a-half years of my life—since my daughter was 11 months old—I have been very involved in fitness. My knowledge of exercise and my own body has grown dramatically. I competed in 11 bikini competitions in 2013-2014, and I've worked closely with a coach who helped me with my diet and exercise routine. FP: How is your first and second pregnancy different? AU: During my first pregnancy I had very little knowledge about exercising, especially exercising during pregnancy. I was constantly afraid of doing too much, so I erred on the side of doing too little. I would take an occasional yoga class or go on a hike once every two weeks or so. When I became pregnant in the winter of 2014, I decided that I would continue my fitness regimen as much as possible throughout my pregnancy. My goals were to maintain my muscle mass as well as my endurance during the pregnancy. Being able to compare my first pregnancy with this current one has been invaluable to me. I have gained slightly less weight—by about 8 pounds. With my first, I gained 35 lbs and I've now gained 27 pounds at 38.5 weeks pregnant. But more importantly, I have had tons more energy, have had less depression during this pregnancy, and have felt more positive and more empowered than ever before. I feel strong! I feel capable! I don't feel quite as needy or unable to do what I need to do, even during this last month of pregnancy. Its amazing! 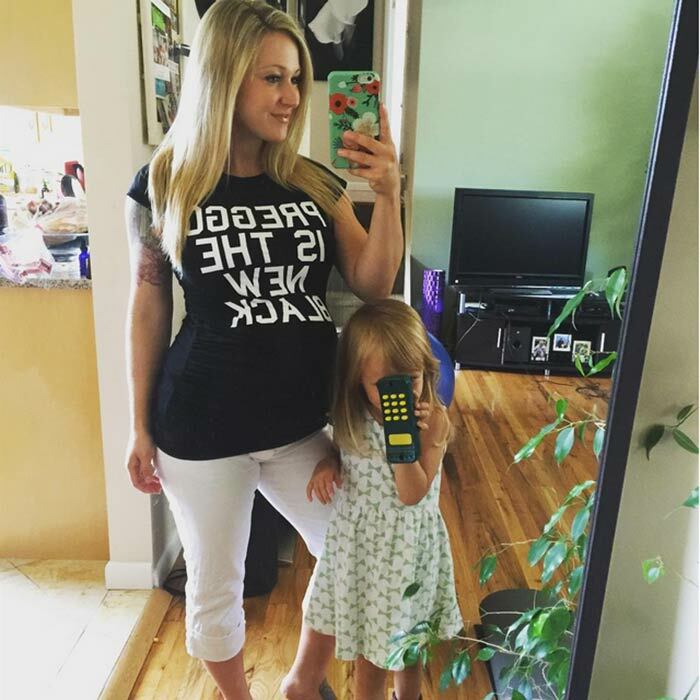 More than anything, I feel more empowered as a mom and as a woman during this pregnancy! FP: What types of workouts have you done while pregnant with your second child? AU: I have continued to lift weights about 3-5 days per week, and I also incorporate some low-intensity cardio. I very much listen to my body and do what feels good to me. I have split my weightlifting workouts into different muscle groups, as I did before pregnancy, or I have grouped some of my workouts into whole-body workouts. I have begun to use resistance bands more now than I ever have before. This has helped me to create low-intensity workouts that I can do anytime and anywhere. No matter what I choose to do for workouts, I follow my body's lead and do what feels good. I make a point to do something active almost every single day! Whether I get to the gym to lift, do a quick body-weight workout in the park while my daughter plays, [use] resistance bands at home, or [take] a brisk walk through the neighborhood, I try to do something to get my body moving every day. FP: Wow, that's so much! When do you rest? AU: There are days, when I am too exhausted, sore, or worked a 12-hour shift at the hospital, [on which] I choose to just rest and relax. I cannot stress enough how important it has been for me to listen to my body and do what it tells me. With that said, I have trusted my body during the pregnancy to tell me when I am pushing too hard so that I don't injure myself. I have kept having good form in the front of my mind at all times while lifting and have lowered my weights dramatically as the pregnancy has continued. Safety is, of course, a huge concern of mine. While I don't count my heart rate while I am exercising, I do make a point to notice how out of breath I am and to slow down my workout and rest when I get too out of breath. I take more frequent and longer rest periods while lifting during pregnancy. FP: What are some common misconceptions you believe many have when it comes to exercise and pregnancy? AU: Many women are led to believe that it is unsafe to exercise during pregnancy or think that only very light cardio is safe. After asking a few doctors and reading articles, I have begun to believe that our bodies are capable of doing during pregnancy whatever they were used to doing before pregnancy. Of course I don't believe a woman should begin a vigorous exercise regimen after becoming pregnant if her body wasn't already doing it before. But I don't believe a woman should need to limit her exercise routine if she has been deemed healthy and low-risk by her OBGYN or midwife. FP: Have you had any bad experiences as your bump started to show? AU: While I have been lifting at the gym, I often get many stares or comments from other people. 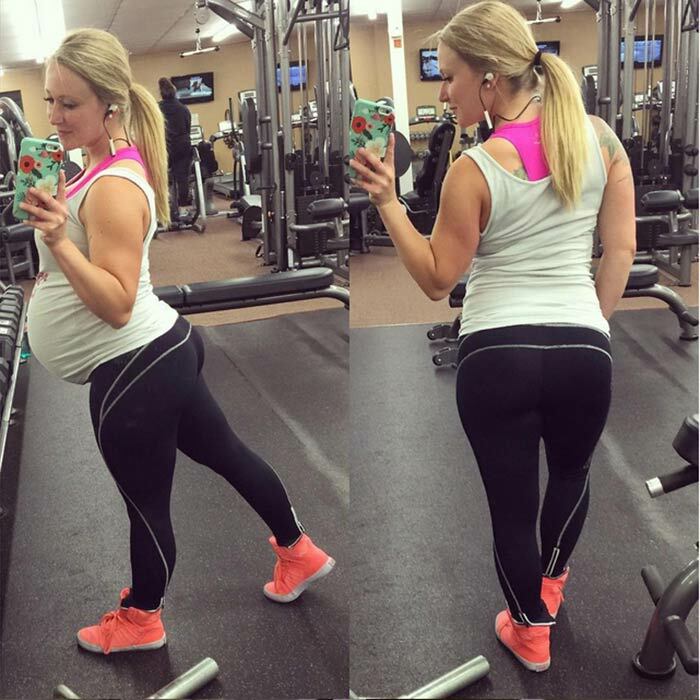 Perhaps other people are still not very used to seeing pregnant women be very active, especially at the gym. But I have been happy to inform them that my doctor/midwife have encouraged me to continue my exercise as long as I feel good and listen to my body for safety! Many of the negative comments I have gotten in person while working out have been along the lines of: "Wow, are you going to have your baby right now?" or "Your baby is going to come flying out if you keep squatting like that!" or "Should you be doing that?" I am always happy to inform them about how good it is for my body and the baby to keep exercising regularly and that I am not injuring myself. FP: What about on your popular Instagram account? AU: I have had mostly positive comments from my amazing followers. But, I have of course had negative comments [from] people who are mostly uneducated about pregnancy, especially exercise during pregnancy. Some people truly just don't know or understand that regular exercise can be a part of a healthy pregnancy! I think the outdated thought that pregnant women should just be very careful and not very active during pregnancy has been passed down from past generations and [has] pervaded the thoughts of people, even of my current generation! Educating others has become a passion of mine—that exercise can and should be a part of pregnancy when the pregnancy is low risk and the woman is healthy. FP: What do you hope your followers feel after knowing your story? AU: My hope is to encourage women to continue the level of fitness that they had before pregnancy and make healthy choices as far as diet to reap the benefits of being physically active as well as not [gaining too much] weight during pregnancy. The more weight a woman gains during pregnancy, the more likely she is to feel slow and sluggish and uncomfortable the last few months of pregnancy. How awesome would it be for more women to be moving and feeling great right up until those last few weeks or even days of pregnancy?! Check out Updike's Instagram, @fitamysuzanne, and website for more awesome photos of her fit baby bump, along with videos of her workouts.